Welcome to the Salty Dog Retreat! This 3 bedroom, 2 bathroom beach cottage is located in the Thomas Drive area and is convenient to the beach, restaurants and attractions! Enjoy lounging in the hot tub after a long day at the beach! This brand new luxury series hot tub seats 7 and features LED lighting and a waterfall. Interior features include wood laminate flooring throughout the entire house, granite counter tops and stainless steel appliances in the kitchen, and a jetted tub in the master bathroom. Comfortably sleeping 10 occupants, this home has a king bed, a queen bed, two double beds, and a queen sofa sleeper in the living area. Exterior features include a fully fenced backyard, hot tub, deck, gas grill and outdoor shower. This home is pet friendly so don’t forget your pups! $150 non-refundable pet fee is required per dog. 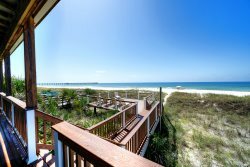 Beach access is approximately 500 yards away. The communication with the team is good they helped me when I had questions for them and they solved one or another inconvenience. I am very satisfied with my stay in that place.